Shearwater barracks near NE 80th Street, north of the present site of Decatur School. Photo courtesy of the National Archives of Seattle. In the 1950s the very active Wedgwood District Community Club made its voice heard in issues such as the completion of streets, water and other utilities, business district development in Wedgwood, and trying to get the Seattle Parks Department to finish work on Dahl Field. Since World War Two had ended in 1945, by the 1950s the Wedgwood community thought that military housing in the neighborhood had been there long enough. After impatiently waiting ten years for the Navy housing in Wedgwood to be phased out and closed, in 1956 the community club took action. Their goal was to get the Navy’s Shearwater Housing Project vacated and torn down. This article is part two of the long-running story of the Shearwater fight in Wedgwood. The Wedgewood Estates Apartments is one of the few businesses in the neighborhood which still uses the extra “e” in the name. The rental office is at 3716 NE 75th Street, in one of the original brick fourplexes built in 1949. One of the issues which caused the formation of the Eastwood Community Club in 1946 was the desire of homeowners not to have any apartments or other multiple-family zoned areas in Wedgwood. The members of the Eastwood group were primarily concerned with the east side of 35th Ave NE, which had a lot of vacant land. 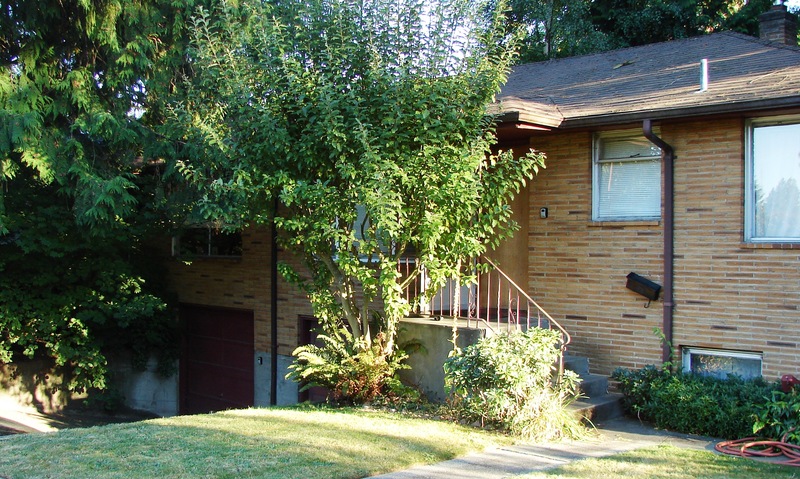 Eastwood wanted eastern Wedgwood to be single-family only and have the consistent, tidy look of the streets and houses built by the original Wedgwood developer Albert Balch on the west side of 35th Ave NE. The Eastwood club unsuccessfully opposed the application of a development company to build the Oneida Gardens apartment complex, which was completed in 1949 and later renamed Wedgewood Estates. That apartment complex, built on what had been vacant land, extended from NE 75th to 77th Streets, 37th to 39th Avenues NE. In the 1980s additional buildings, three-story wood-frame, were built between the original fourplexes and the name of the apartments was changed to Wedgewood Estates at that time. The next zoning fight of the combined Eastwood-Wedgwood District Community Club was in 1951, over applications to build duplexes on NE 77th Street and on 43rd Ave NE. In 1951 the Wedgwood Community Club protested the building of this duplex at 4303 NE 77th Street. In 1951 the three-man committee of the Seattle City Planning Commission was headed by architect Clyde Grainger. Grainger certainly was familiar with Wedgwood as he, along with architect Harlan Thomas, had helped to create it. Their architectural firm had designed Albert Balch’s original Wedgwood-development houses in 1941. Clyde Grainger designed the Balch offices. Photo 76719 Seattle Municipal Archives. In 1941 Clyde Grainger built his own house in View Ridge at 6546 52nd Ave NE, two blocks east of developer Albert Balch’s home at 6850 50th Ave NE. By the late 1940s architect Harlan Thomas had retired, but Clyde Grainger still worked at their architectural office and Grainger continued to contribute to the development of Wedgwood. In the period of 1948 to 1951 Grainger’s architectural firm, which included Harlan Thomas’ son Donald Thomas, designed Balch’s complex of medical-dental office buildings from 8014 to 8050 35th Ave NE. When the Shearwater site was auctioned in December 1965, the parcels for sale were numbered 1 through 5. The “school” site is Decatur Elementary School. The blacked-out sections were not owned by the Navy and were not part of the auction. Ultimately the Seattle City Planning Commission approved the duplexes, and by the end of the 1950s there was a row of four brick duplexes in the 7500 block of 43rd Ave NE. But the new (combined) Wedgwood Community Club continued to fight to keep Wedgwood an area of single-family housing, and what they learned from the duplex application was that they needed to change the zoning on the east side of 35th Ave NE in the area around the Shearwater barracks of Navy housing. The blocks around Shearwater which included 43rd Ave NE between NE 75th and 77th Streets, was zoned “multiple.” That was the same reason why the City Planning Commission had approved the Oneida Gardens apartment building between NE 75th to 77th Streets, and the duplexes on NE 77th Street and 43rd Ave NE. A line in the 1945 annual report of the Seattle Housing Authority seemed to imply that Shearwater was not of the quality that they would have liked, due to extreme shortages of building materials. The 315 units of wood-frame barracks-style buildings quickly deteriorated. After April 1948 when ownership of Shearwater was transferred to the Navy, no further maintenance or improvements was done to the buildings. Seattle Housing Authority annual report of 1945. In the middle of the second page, they wrote that some of the temporary housing was not of the quality that they would have wanted. Although Shearwater is not specifically named in these paragraphs, it can be implied because Shearwater was built in 1945. Shearwater barracks and playground. Photo courtesy of the National Archives of Seattle. In the late 1950s some of the Shearwater units were vacant as the number of military families declined or the families were able to find other places to live. A play area had been set aside for Navy children just north of the present site of Decatur School, nearest to NE 80th Street. The Navy did no other development or improvement on or around the Shearwater site, which included housing on some other streets near Decatur School. The streets around Shearwater were unpaved and there were no sidewalks. Nearby homeowners were irked because the Shearwater area was not being kept up and they felt that the conditions were detrimental to the appearance of Wedgwood. It had taken until 1954 for all of Wedgwood to come into the city limits of Seattle, with the north city line finally set at NE 145th Street. With city boundaries in place, City Council worked on an overall zoning map and zoning ordinances for the entire city. The Planning Commission sent its recommendations to Councilman Massart, and his Public Safety Committee’s review was the last step before a proposal on zoning was to be sent for a vote at City Council. Wedgwood would be affected in how the site of the Navy’s Shearwater housing would be zoned. Would it be zoned for future multiple-dwelling units such as apartments and duplexes, or zoned for single-family houses only? City Councilman Clarence F. Massart (at right) with Mayor Gordon Clinton and celebrants, ribbon-cutting for Ballard Bridge Overpass, December 12, 1958. Photo #60284 courtesy of the Seattle Municipal Archives. City Councilman Clarence F. Massart was a “Seattle success story” as he had come from a farm background and arrived as a young man in Seattle, ready to make his fortune. He became successful in business and later in political office. Massart grew up as one of fourteen children on a Wisconsin dairy farm. He served in the First World War and in 1920, at age 22, he came out West with some of his brothers. For many years Clarence Massart owned a plumbing and heating company in the Wallingford neighborhood of Seattle, where he was active with the District Commercial Club (like a chamber of commerce) and with the Associated Clubs of North Seattle. He was known for his ability to solve problems and get things done, and this was what got him elected to Seattle City Council in 1950. During his seventeen years as a city councilmember Mr. Massart enacted a series of building-code modernizations and city-wide zoning changes. Shearwater barracks along 43rd Ave NE. Photo courtesy of the National Archives of Seattle. Mrs. McNulty was active in Wedgwood neighborhood concerns and she often read prepared statements from her father when he could not attend Wedgwood Community Club meetings himself. The community club’s recruitment of Councilmember Massart into the concerns about Shearwater was a strategic success, because he lived in northeast Seattle and was familiar with the Shearwater situation, and he could influence how Seattle’s new zoning regulations would be written. But also in August 1957, Seattle City Council enacted the new citywide zoning regulations which had been prepared by Councilman Massart’s Planning Commission, and they voted to make the Shearwater housing area in Wedgwood a single-family zone. This meant that when the Navy housing was vacated, it could only be replaced with detached single-family houses, not apartments or duplexes. The 1957 victory in zoning regulations came after the community club had lost the fight to prevent the Oneida Gardens (Wedgewood Estates) apartments from being built in 1948-49, and their 1951 protest of duplexes on 43rd Ave NE. After the 1957 zoning decision the community club still hoped that in future the rest of Wedgwood would be a neighborhood of single-family housing only, including the east side of 35th Ave NE where most of their zoning concerns were focused. The September 1957 edition of the Wedgwood Echo community newsletter told of action to get the Shearwater buildings removed. One of the reasons cited was that the substandard housing was not honorable for military who were serving the USA. At left was an article noting the high enrollment of children with 919 students at Wedgwood Elementary. Wedgwood opened in 1953 with portables only. Decatur School was not built until 1961. Headlines of the August and September 1957 editions of the Wedgwood Echo, the community club newspaper, triumphantly proclaimed victory. Using an idealized Balch house as the masthead on the Wedgwood Echo, the lead articles were written on the presumption that Shearwater would soon be torn down and would be replaced by single-family homes consistent with the rest of Wedgwood. Victory was not immediate, however. Decatur School as it looked in 1963, before Shearwater barracks buildings were cleared from the site and an addition built in 1966. The front door of the school building is on NE 43rd Street at the top of the photo. At right is NE 77th Street. Courtesy of the Seattle Public Schools Archives #287-1. After two more years went by, in late 1959 the Seattle School District requested that some of the Shearwater property be given by the Navy for a much-needed elementary school. This was done, and in 1961, Decatur School was built at at 7711 43rd Ave NE. There is now a separately-operating second school building, Thornton Creek Elementary, on the same block with Decatur School. As of 1961 there was still some Shearwater housing on the same block as the Decatur School. These barracks were gradually vacated and were demolished in December 1965. By 1966, with an addition to the southern end of the Decatur School building and more playground space, the entire block from NE 77th to 80th Streets was cleared and belonged to the school, as it does today. In 2016 a second school building, Thornton Creek Elementary, opened on the same block, facing 40th Ave NE. Even after the Decatur School block was cleared of barracks buildings in 1965, there were still some Shearwater buildings on surrounding streets with many Navy families still living in Shearwater housing. Even the name of the school had been selected in tribute to the Navy, since a large number of the Decatur schoolchildren were from Navy families still living in Shearwater. Some Navy families had moved into the nearby Oneida Gardens apartments. So many Navy families lived at Oneida Gardens that many people thought the Navy owned the apartments, but they were owned by a private developer. After the supposed zoning victory of 1957, it would take another nine years before the rest of the Shearwater housing in Wedgwood, on streets surrounding Decatur School, was finally gone. To be continued in Part Three: Shearwater victories and setbacks in the 1960s. This entry was posted in apartments, boundaries, community club (old), Controversies, School histories, Shearwater and tagged Neighborhood History, Seattle, Shearwater Navy housing in Seattle, zoning. Bookmark the permalink.